Furniture Canada is an online retailer providing competitive prices of contemporary, modern and traditional discount furniture. We are continuously working towards expanding our online inventory with quality products on affordable prices. By offering free shipping in Canada, we aim at keeping the majority of our market within the borders. We do offer shipment to the US, but it is not free. Our office is based in Toronto, Ontario, but we work with manufacturers and distributors from all over Canada. This allows us to offer free and fast distribution throughout the country. 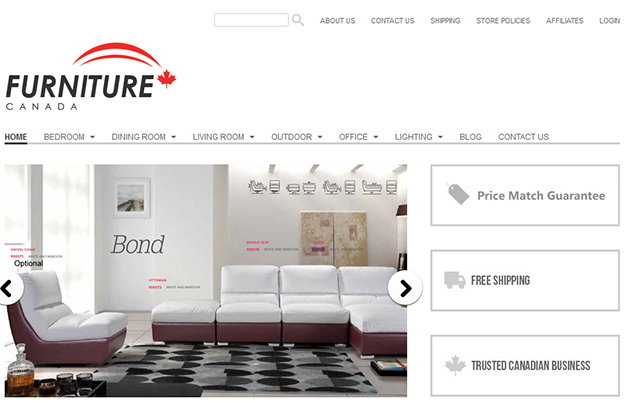 At Furniture Canada we dedicate our resources towards a continuous growth! Our team has worked hard to build up a reputable online establishment, so we can rank in the top percentile for online furniture stores. Thanks to our customer support and innovative marketing we are able to offer a memorable shopping experience. What makes us better than everyone else, is that we don’t hide anything from our current and potential customers. We answer any and all questions, and we gladly refer customers to the desired manufacturer if they have more technical questions regarding the product.